Sandwiched between Rio de Los Angeles State Park and an unusually verdant meander of the L.A. River in Glassell Park, you will find the crumbling remains of a railroad empire. 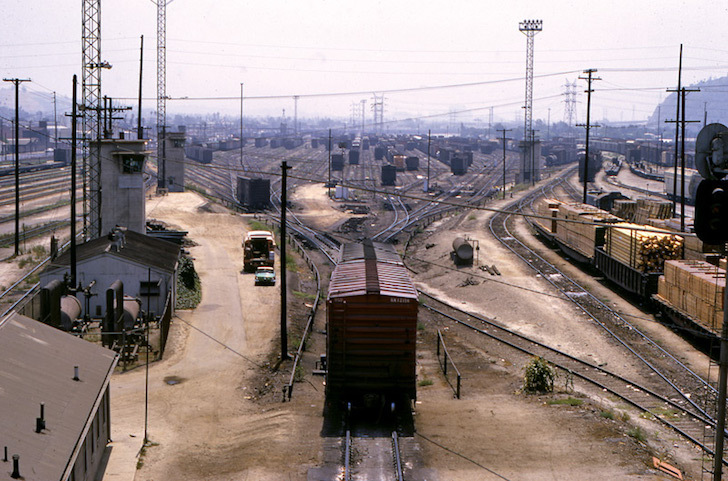 Littered with rocks, rubble, and the occasional old rail tie, the 41-and-a-half-acre plot of land—known officially as the G2 parcel—is the last vestige of Taylor Yard, a freight-switching facility that was the core of the Southern Pacific Railroad’s L.A. operation for about 60 years. More recently it’s become one of the most coveted pieces of riverfront property—at least along the 11-mile stretch that the city has committed to redeveloping. An ambitious restoration plan approved two years ago by the U.S. Army Corps of Engineers aims to remove what Mayor Eric Garcetti has called the river’s “concrete straitjacket” and to install a string of public parks along its banks. He called the G2 the “crown jewel” of that string in January, when the city council voted to buy the parcel. But before the so-called crown jewel of the Los Angeles River Revitalization effort can shine, it’s going to require a whole lot of polishing over the next several years. Just securing the land took decades. After Taylor Yard shut down in the 1980s, city officials and river activists began a fight to reclaim the property from Union Pacific (which bought Southern Pacific), to the tune of $59.3 million. If everything goes as planned, the parcel will connect Rio de Los Angeles State Park with the state-owned G1 (or “Bowtie”) parcel to the north, opening up more than a mile of river access in a historically working-class neighborhood and allowing for a large swath of the river’s ecosystem to be restored. Estimates are that it’ll take $252 million to transform G2 into clean park space. So far city hall has secured around $22 million to that end, which is to say, you shouldn’t pack a picnic just yet. But according to Deputy Mayor Barbara Romero, once the city determines which sections of the parcel are safe to use now, it plans to open them up for a range of activities (say, camping, fishing, or film screenings). It’s a tactic similar to the one Woods used at L.A. State Historic Park. “This is a really critical part of the engagement process,” says Romero. “The goal is to get people to use the site [and] to use that as a way to inform the rest of the development.” Limited public access should be allowed in about three years. And maybe by the time the actual park is done, city officials will have figured out how to get their hands on the white whale of the L.A. River Revitalization project— Union Pacific’s still-active Piggyback Yard, across the river from Union Station.